Check out the ten-minute clip below which shows how cool Android can be once it starts arriving in cars. 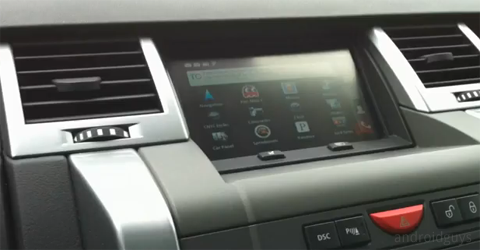 One of our readers passed along the following video where a Droid Incredible is used as a replacement for the OEM NAV that came with his Range Rover Sport. Using a GVIF cable, he was able to switch off the standard dash and GPS and power it with Android, namely a Droid Incredible. And it’s full of win. Naturally Google Maps Navigator looks awesome on a bigger display, but we can imagine any preferred GPS title (Waze, TeleNav, CoPilot) would look equally impressive. Everything you would normally see on the handset would translate to the monitor. Unfortunately, not all apps work in landscape mode and tend to look somewhat goofy. However, Pandora, Slacker Radio, and other streaming services could really enhance your daily commute! Twitter, Facebook and other apps would be nice to see on a larger screen, but could prove to be more of a distraction than a bonus. Remember kids, don’t text and drive. Or play with an 8-megapixel camera and drive. So how is all of this hooked up? According to the YouTube video description, it’s a pretty common cable and would also work on a Jaguar, Lexus, and Toyota Prius. HTC Droid Incredible TV-Out to my Range Rover Sport. This is the ultimate carputer ; replacing the built in OEM NAV using Google Android. Using the TV-Out, I connect to a GVIF adaptor that allows me to bypass my Car’s built in OEM. I can’t wait to see cars designed with Android already in the display and dashboard. What about you? Thanks to HD for the tip!